Sorry this post is a day late -Virgin broke our interweb and telly yesterday, it only came back about noon today. So, here is yesterday's report, today's will follow shortly! Breakfast today was back to normal, a slice of toast and jam, which Hannah found much easier to cope with than yesterday's porridge. Leftover vegetables (carrot and parsnip) were served for lunch along with some fingers of emmental, a rice cake with lentil pate, followed by some Greek style yogurt mixed with a bit of raspberry jam and some raspberries I defrosted for her. So all in all I don't think raspberries will be back on the menu very soon. Fresh raspberries might work better as they would hold together better than the defrosted ones, so perhaps we'll try them again next summer. 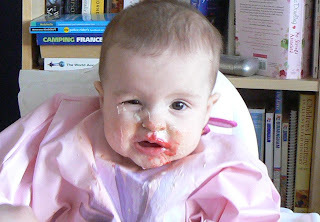 Oh yes, and once she'd got the raspberry in her mouth and immediately spat it out all down her bib, it looked like she was dribbling blood, making the clean up operation quite exciting. The face is a classic, be sure and try the rasberries again in a while im always shocked at what the kids will eat one week then not the next. We've got raspberry canes in the garden, so she'll definitely get some next summer, not sure I'll get any before then but we'll see!